The EU’s external energy security is in Washington’s longterm interest, especially at the time of renewed rivalry between the West and Moscow, writes Jaros?aw Wi?niewski . Jaros?aw Wi?niewski is an academic and political analyst who specialises in energy security, international security and European politics. Pipeline politics are back. They were never really gone, with the previous decade being dominated by the virtual rivalry between Western–backed Nabucco and Russian South Stream. Ukrainian Euromaidan and the consequent freeze in relations between the West and Russia have put pipeline politics again high on the agenda. Those who thought that cancellation of South Stream would mean end of Moscow’s ambitions of a direct supply route to Southern Europe were quickly awaken by the announcement of Turkish Stream, and other pipe dreams aimed to link Russian resources with European and Asian markets. The West’s ‘response’ is more limited, with the Trans–Adriatic Pipeline as the only viable alternative. The EU’s external energy security is in Washington’s long-term interest, especially at the time of renewed rivalry between the West and Moscow. Turning a network of virtual pipelines planned for South East Europe, built around the Trans-Adriatic Pipeline may be a herculean task, especially in the current climate of decreasing confidence in the project of European integration. The EU with its Eurozone-centred attention may not be capable to answer its own energy security challenges by itself. The USA may well be the only actor capable of multilateral lobbying as was shown in the case of the Baku-Tbilisi-Ceyhan pipeline built over a decade ago. 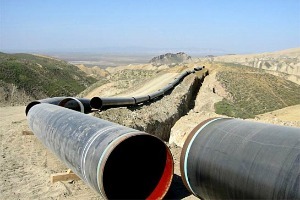 The USA offers one invaluable lesson, the history of the Baku –Tbilisi–Ceyhan pipeline. Pipelines in Eurasia were never only about gas or oil. They were also instruments of long (or short term) policy goals of different countries. There is no better example of this than the only (so far) successful pipelines transmitting Caspian oil and gas without the use of Russia-controlled distribution network – the Baku–Tbilisi–Ceyhan (BTC) and Baku – Tbilisi – Erzurum (BTE) pipelines. The BTC was the first pipeline that bypassed both Russian territory and the Turkish straits. The main argument in favor of the pipeline was to relieve traffic congestion in the Bosporus and Dardanelles Straits. The project was backed politically and financially by the US and the EU, even though it was longer and more expensive that other options. What made the project possible was an implicit support from the White House. Political objectives have overshadowed the obstacles of construction as well as its commercial competitiveness. They allowed the West to establish its presence in the Caspian basin, to provide a real physical alternative route for Caspian oil, other than through Russian pipeline systems. The route of BTC was mirrored by the BTE (Baku–Tbilisi–Erzurum) pipeline, exporting Azerbaijani gas. The EU flagship effort to mirror BTC’s history – Nabucco – was far less successful. It was projected that the potential route would link the Caspian Basin with Europe, up to the hub that was planned to be set up in Austria. After almost 11 years of planning (first talks begun in 2002), Nabucco was finally axed in June 2013. Learning from the lesson success (BTC) and failure (Nabucco) will be critical for the future of TAP. One of the main conclusions is that a stronger political support from Washington could make this new pipeline more realistic. TAP creates also other opportunities, one of them being an important part of the US foreign policy since the early 1990s. American involvement in the stabilization of the Western Balkans can be tracked back to the early 1990s. Tirana seems to be the most important regional ally of Washington (where the US has involved significant resources over the last 25 years, as greatly explored by Fred Abrahams in ‘Modern Albania’. Albania is also the most important place on TAP’s map. Albanian authorities would not only build a national gas grid and an underground gas storage facility, it would also create a potential hub which could send gas further not only to Italy, but also north (Ionian-Adriatic Pipeline) and east (Gas Interconnector Greece-Bulgaria). Any potential physical network connecting South East European countries would create additional incentives for them to cooperate, which could, potentially, lead to spill over into cooperation in other areas. With growing regional tensions, e.g. over the numbers of immigrants from the Middle East, still unfinished post-war business from the 1990s, and the EU’s attention turned elsewhere (Eurozone, refugees, Brexit), Washington is the only actor who can push for stability. In addition, taking into consideration the current age of rivalry with Moscow, Balkans are an area of potential spats. Pipelines remain to be important tools of Russian foreign policy. Increasing the capacity of Nord Stream, building Turkish Stream, Yamal, GTS, Eastern Ring, pipeline to China – information about all of these is present in the newspapers on an almost daily basis. In most cases they are simply bluffs aimed at mudding waters and achieving short-term goals by playing on differences between European countries. A significant US involvement in TAP would be a call on Russia’s pipeline bluff. It could also help TAP in avoiding the fate of its predecessor Nabucco. In the end, all pipelines remain to be virtual until they are strongly lobbied for. There are signs that this might be the case now, as Serbia’s prime minister implicitly admitted after his recent trip to the US. This only confirms that the EU’s external energy security might actually be taken very seriously in Washington. Washington’s BTC experience, combined with its LNG potential, and the new energy realities created by the deal with Iran, could potentially solve the EU’s energy dilemmas. The current dynamics suggests that help from across the Atlantic may well be indispensable for Europe.